The American Marketing Association Knoxville (AMAK) has honored Alan Carmichael, president and COO of Moxley Carmichael, as its 2018 Outstanding Marketing Professional. The lifetime achievement award, which was presented in May at the AMAK’s annual HONORS celebration, recognizes significant contributions in marketing and the community. Previous honorees include Pilot Flying J Founder Jim Haslam II, former University of Tennessee women’s basketball coach Pat Summitt, advertising executive Townes Lavidge Osborn, AC Entertainment CEO and Founder Ashley Capps and Carmichael’s wife, Moxley Carmichael CEO Cynthia Moxley. Carmichael joined Moxley Carmichael in 1998. He also has held communications leadership roles at Tennessee Valley Authority (TVA), where he was senior vice president, and The Tennessean newspaper in Nashville, where he was assistant city editor. “I deeply appreciate the American Marketing Association Knoxville selecting me for this honor,” Carmichael said. “I have been lucky to have been associated over the years with very talented people: my wife, my associates at Moxley Carmichael, TVA and The Tennessean in Nashville. 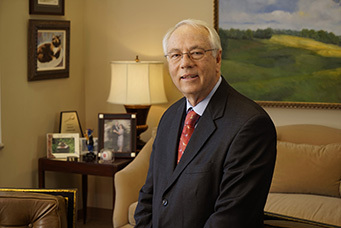 During his career, Carmichael has provided marketing and public relations counsel and assistance to such Moxley Carmichael clients as Pilot Flying J, Covenant Health, U.S. Cellular, Knoxville Utilities Board (KUB) and the Tennessee Theatre, among many others. For TVA, he led communications for 10 years of stable electric rates and managed the agency’s first region-wide advertising program. The AMAK awards ceremony was held May 15 at the Southern Railway Station in downtown Knoxville and also recognized chapter volunteers and scholarship winners. AMAK, a chapter of the American Marketing Association (AMA), brings together marketing minds across Knoxville and the region through professional development events, networking opportunities and monthly luncheons. Formed in 1988 as the AMA Knoxville Interest Group, AMAK officially joined the AMA chapter network in 1989. East Tennessee’s premier public and media relations firm, Moxley Carmichael provides strategic communications services to leading local, regional and national companies and organizations. Utilizing its team’s talent and experience, Moxley Carmichael excels at raising client visibility in the marketplace and community. Moxley Carmichael, which celebrated its 25th anniversary in 2017, provides a full range of services, including public, government, media and community relations; corporate communications; branding; research; graphic design; advertising; digital media; web design; media and networking training and more. Moxley Carmichael is located in the historic Miller’s Building on Gay Street in downtown Knoxville. For more information, visit www.moxleycarmichael.com.